They’re rad! Right? Right? Well, okay, maybe “rad” is a little strong. 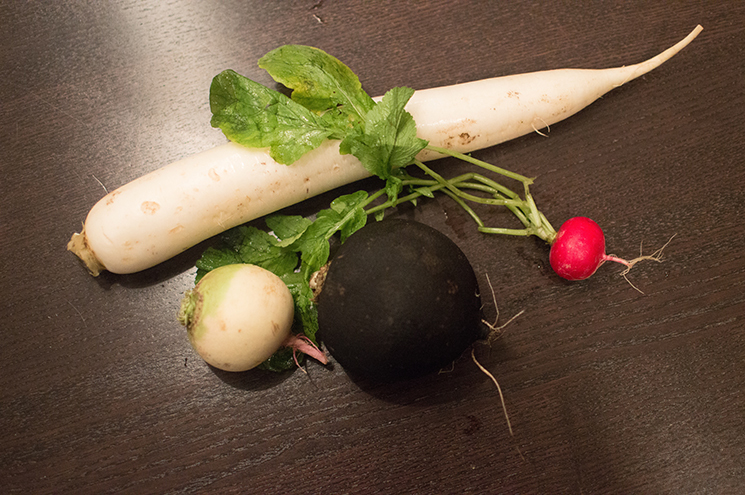 In all honesty I’d never given a thought to radishes before we started the CSA thing. I could’ve eaten one radish per year (not one bunch; one radish, mind you) and been perfectly happy. But then the crop share started. Farmers are apparently nuts for radishes. I get it, they grow quickly and easily in a wide range of climates. There are lots of varieties and they’re all very different and often quite pretty. The thing is … when I’m planning my menus for the week, of all the awesome ingredients that populate my mind, radishes just don’t come up. Never. Not once in my life have I thought “hey that’d be really beautiful with radishes on top” or “what this needs is some radish to balance out … whatever.” Additionally, radishes multiply like bunnies. You start cutting up one small bunch of radishes. Maybe there are 7 radishes. They’re small. It doesn’t seem like a ridiculous amount of vegetable to use in any given recipe. But you start slicing them and 7 tiny radishes somehow turn into quarts and quarts of processed radish. It quickly becomes overwhelming. Also, you tend to see them on salads and in pickled form, meaning whether they’re raw or cooked, they’re still almost always crunchy. And there’s only so much crunch necessary in any given day’s worth of food. So they’re hard, and I’m often stumped. Fortunately, I enjoy nothing more than a challenge. So, bring it, radishes. It’s on! We primarily receive 4 types of radish in our crop share: red radishes, daikon, black winter radishes and watermelon (or beauty heart) radishes. They’re all very different. For the red radishes, I like to make a bagna cauda, which is kind of like a butter and anchovy fondue. You can add garlic too. I use half a stick of butter and one white anchovy. Melt the butter with the anchovy, skim off the white stuff (milk solids) after it melts, then serve with halved or quartered radishes and some Maldon salt. 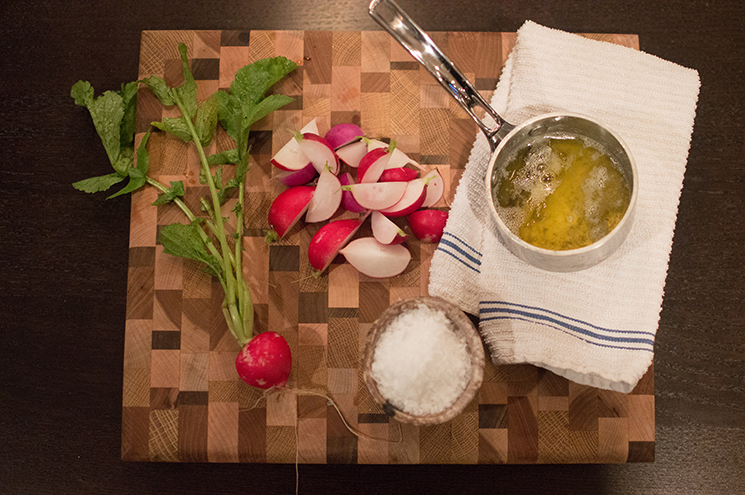 Just dip the radish in the bagna cauda, sprinkle with salt and munch away. 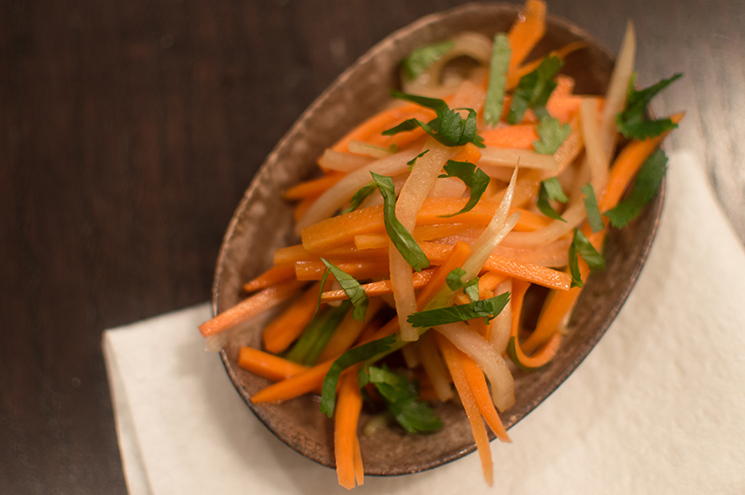 For the daikon, an Asian-inspired slaw is a pretty obvious pick. For this one, I julienned a 6” piece of daikon, 2 scallions and a medium carrot, then tossed then with 1 tablespoon fish sauce, 1 tablespoon soy sauce, 1 tablespoon sesame oil, the juice of 2 small limes and a pinch of sugar. Top with some chopped cilantro and it makes a nice, sturdy little accompaniment for meat or fish and sticky rice. For the watermelon radish, I’m a big fan of this composed radish salad. I reduced ¼ cup soy sauce and ¼ cup balsamic vinegar by half, then transferred the sauce to a squeeze bottle and chilled it. Then I tossed 2 small diced watermelon radishes (red part only) in just enough olive oil to coat them. I mixed 3 ounces softened goat cheese with 1 tablespoon heavy cream. Then I picked the prettiest baby arugula leaves I could find from a 5 ounce bag. Place 3 or 4 of the pretty leaves on each of 6 plates, smear cheese mixture in a radish shape beneath the leaves, then place the diced radish at the top of the cheese mixture. 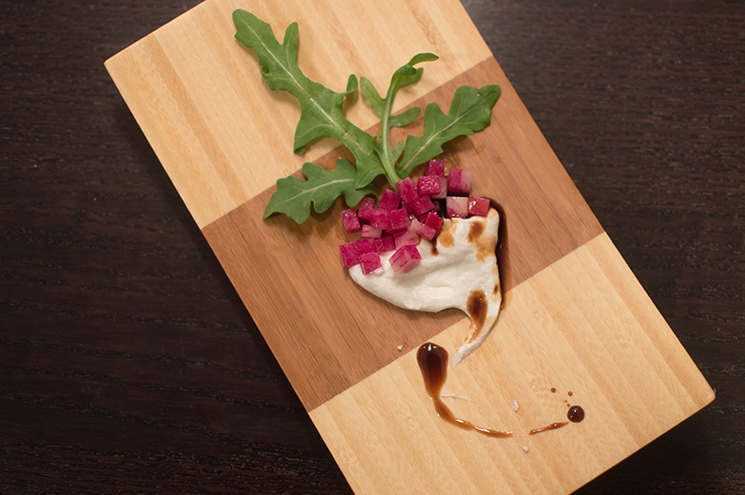 Drizzle with the sauce to mimic the shading and roots of a red radish. Sprinkle with big, flaky salt. On to the challenging part though. Can radishes be anything but crunchy? Turns out, the answer is yes! I decided to make a Thai curried radish soup with shrimp and rice. 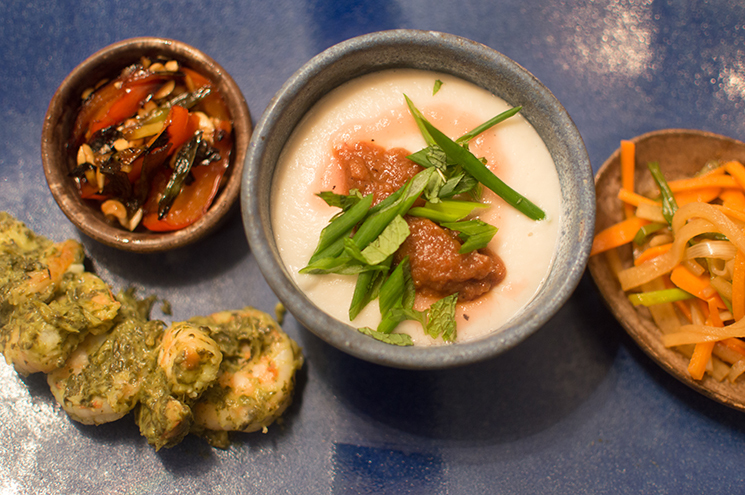 There are four elements in this dish, using different radishes and radish parts. Combine all ingredients in a large saucepan and bring to a boil. Reduce heat and simmer about 30 minutes, or until radishes are soft. Puree in a blender and return to pan or cool until later. Heat oven to 450. Whisk together oil and curry paste in a medium sauté pan or brasier. Add radish and toss to coat. Spread in an even layer. Roast 20 to 30 minutes, until radishes are very tender. Transfer to a blender, add ½ cup water and puree. Transfer to squeeze bottle. Combine all ingredients in a small saucepan and bring to a boil. Reduce heat and simmer 20 to 30 minutes, until radishes are tender. Puree and transfer to squeeze bottle. Blanch greens and cilantro and dry completely. Chop greens and cilantro and add to food processor with avocado, lemon juice, 1 T olive oil and ½ t salt. Puree. Heat a large sauté pan over medium high heat. Add olive oil and swirl to coat pan. Add shrimp and salt and sauté, turning once 4 to 5 minutes, until cooked through. Add greens sauce to pan and toss to coat. Reheat daikon mixture and divide between 4 shallow bowls. Top with curried radish puree and wine-poached radish puree. Top with shrimp and serve. Top with chopped mint and scallion if desired. I served with a little white sticky rice and sautéed bell peppers, scallions, garlic and ginger with lime, soy, brown sugar, fish sauce, mint and chopped peanuts. That daikon slaw is nice on the side too. I was really impressed with the softened flavor of the cooked radishes. 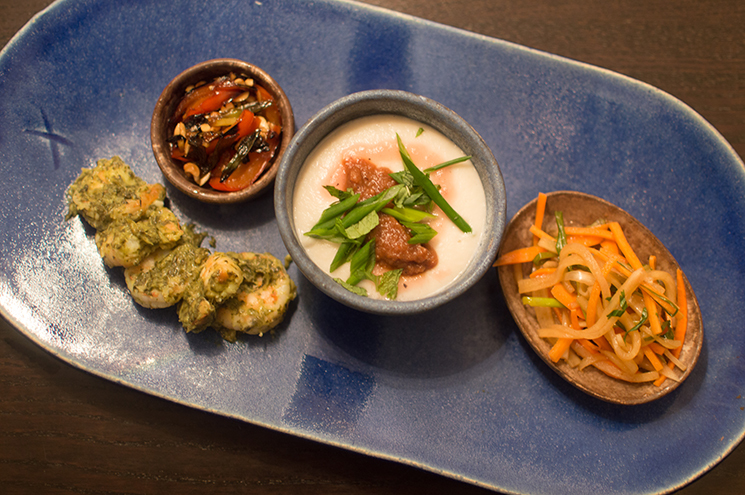 I think the roasted watermelon radishes with the curry paste would be nice on their own too. Maybe a little on the hot side, though. While I probably still won’t ever think “oh yeah this just needs some radishes and it’ll be perfect!” — I think I’ve gained a little more respect for them, and I’m pleased to find that there are other options for radishes besides crunchy and raw or pickled. Personally, I love all the radishes from HVF. Nothing says ‘Spring’ to me quite like the first French Breakfast radishes. I’ll have to give your radish soup a try. It sounds delicious! Do you ever julienne radishes for spring rolls?